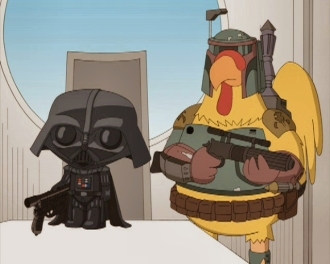 I haven't watched Family Guy regularly since before its 2001 "cancellation" and I'm not the galaxy's most devoted Star Wars fan, but somehow the mixture of both franchises seems fitting. 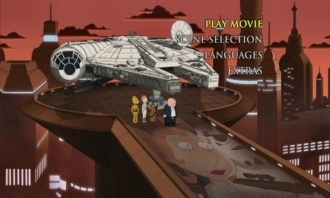 After having seen and enjoyed 2007's Blue Harvest, the season 6 Family Guy premiere that parodied Episode IV: A New Hope, this Empire-infused follow-up undoubtedly promised more of the same: in addition to riffs on the Star Wars universe (approved by George Lucas himself, as evidenced by the music cues and sound effects), it also made use of the polarizing Family Guy formula of cutaway gags, pop culture references, seemingly random guest stars and destruction of the fourth wall. Again, not the most seamless blend of two popular franchises, but somehow it's worked thus far. 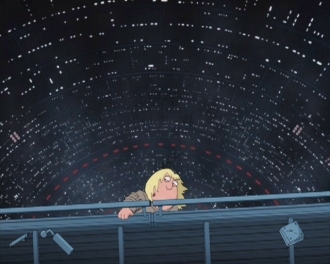 As Empire is easily my favorite of the Star Wars films, I had somewhat high hopes for this second installment of a most unusual tradition, which will air as the finale of Family Guy's eighth season in May. For the most part, it keeps the ball rolling: we're quickly caught up with Luke (Chris), who undergoes training with Yoda to develop his use of The Force. Han (Peter), Princess Leia (Lois), Chewbacca (Brian) and company set out to find the young protégé, while Darth Vader (Stewie) and The Empire wait in the shadows. Han's group is finally caught when Lando Calrissian (Mort) sells them out to Vader---and, like the original Empire, Han is eventually frozen in carbonite. Someone is revealed to be someone else's father and all that. Of course, the plot of Empire hasn't been completely pilfered, though Something, Something, Something Dark Side isn't even half as original a parody as Spaceballs was more than 20 years ago. Yet the finished product is harmless in its imitation of the beloved sequel to Episode IV, mainly due to the approval of creator George Lucas: the sights and sounds are highly familiar at times, but such reprisals evoke light-hearted nostalgia instead of rip-off outrage. The film's only drawback, of course, is what has crippled Family Guy during the last few years: an increased dependence on cutaway gags, which typically have nothing to do with the subject at hand. An early scene on Hoth is interrupted by a re-creation of the Juicy Fruit skiing commercial from 1987---and if you think that such a left-field link distracts you from this review, it serves the same purpose during the film itself. The gag is slightly amusing on paper, but does such a blatant diversion really pass for clever comedy in some circles? Like Blue Harvest, though, Dark Side earns most of its points for attention to visual details---which, on one hand, have been borrowed from the source material. But the seamless integration of these designs into Family Guys relatively plain-wrap production values gives the adventure more weight, while the inclusion of a few stiff jabs at Empire is certainly warranted. It's also worth noting that this DVD release includes the uncensored version of this 54 minute episode, which will undoubtedly be trimmed when the season finale airs in a few months. Such a marketing tactic is a little sneaky and is certainly designed to milk Family Guy fans' wallets, but that's hardly a surprise at this point. In any case, Dark Side manages to survive a few blatant missteps and serves as a reasonable entertaining follow-up to Blue Harvest---so if you absolutely can't wait until May, have at it. Presented on DVD by Fox Home Entertainment, Dark Side comes equipped in a relatively slim but satisfying one-disc package, pairing a decent technical presentation with a few entertaining bonus features. It's still overpriced compared to the ongoing boxed sets, but frugal fans can undoubtedly find a decent price for this DVD or the Blu-Ray release now that the holiday season has passed. Presented in its original 1.33:1 aspect ratio---at MacFarlane's request, like it or not---this is about as good as Family Guy will look on DVD. Unfortunately, there are plenty of jagged edges from start to finish (which works against this adventure's higher-than-normal production values), but the color palette is bold and black levels are solid. Aside from these slight digital imperfections---which are nothing that Family Guy fans shouldn't be used to by now---there's little to complain about here. Presented in a rather robust Dolby Digital 5.1 Surround mix, Dark Side sounds perfectly suited for big or small screens. Surround channels are put to good use during several of the action sequences, not to mention a number of familiar John Williams cues. Dialogue is generally crisp and clear, while the music rarely fights for attention. Optional English captions and French or Spanish subtitles are included during the main feature only. Seen above, the familiar menu designs are smooth and easy to navigate. The 54-minute main feature has been divided into 12 chapters, while no layer change was detected during playback. This one-disc release is housed in an eco-friendly black keepcase; also included are an embossed slipcover and a promotional insert. A few noteworthy extras are on board here, and most are similar to the ones found on Blue Harvest. First up is a yuk-filled Audio Commentary with creator Seth MacFarlane; producers Mark Hentemann and David Goodwin; writer Kirker Butler; director Dominic Polcino and voice actor Seth Green. This is as rowdy and rambling as expected, with plenty of in-jokes, off-color comments and general tomfoolery. It's admittedly entertaining from start to finish, and includes plenty of production stories and additional comments about the source material that Dark Side was based on. 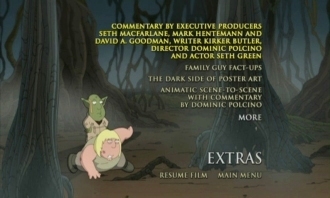 A like-minded "Family Guy Fact-Ups" track is also on board, which serves up nuggets of trivia during the main feature. Up next is "The Dark Side of Poster Art" (9:17), a brief featurette with comments from artist Joe Vaux about his version of the iconic original poster. Continuing the artistic theme, we're also treated to an Animatic Slideshow (6:49) with comparisons to various finished scenes; this also includes audio commentary with director Dominic Polcino. It's admittedly not the most interesting extra (especially since many of the layouts were essentially lifted from other films and commercials), but still worth a quick look. Closing things out are two Table Reads; the first is the entire first and second acts of Dark Side (49:24), while the second is a preview for the upcoming Jedi spoof entitled Episode VI: "We Have a Bad Feeling About This" (2:25). Both are thoughtful inclusions, but the first is only here for die-hard fans of the franchise. All bonus features are presented in 1.33:1 and anamorphic widescreen formats, but none include optional subtitles or captions. It's certainly not a laugh riot from start to finish, but Something, Something, Something Dark Side isn't a terrible way to spend 54 minutes. 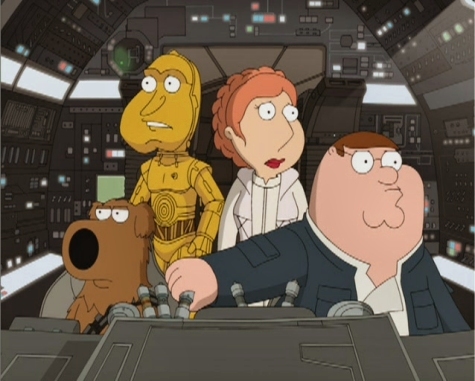 As a continuation of Family Guy's version of the Star Wars saga, it's not very ambitious in the storytelling department, though a few clever riffs on the beloved franchise are well-deserved. Like the similarly-minded Blue Harvest, this production also earns a few brownie points for its excellent visual design---and, with George Lucas' blessing, the inclusion of familiar musical cues and sound effects. Fox serves up a thin but marginally satisfying DVD package, pairing a decent A/V presentation with a few entertaining extras. It's a bit pricey for the amount of content you're getting (especially compared to the ongoing boxed sets), but Something, Something, Something Dark Side should please fans of MacFarlane's long-running franchise. Mildly Recommended.